The total gross state domestic product (GSDP) of Meghalaya was about US$ 4.2 billion in 2014-15, at current prices. GSDP grew at a CAGR of 10.84 per cent between 2004-05 and 2014-15. The secondary sector of Meghalaya’s economy rose at a CAGR of 13.3 per cent between 2004-05 and 2014-15, faster than other two sectors. While the primary sector registered a CAGR of 7.1 per cent between 2004-05 and 2014-15, the tertiary sector grew at a CAGR of 12.3 per cent between the same period. 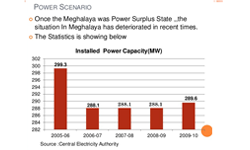 The tertiary sector is the largest contributor to Meghalaya’s economy. During 2014-15, while the tertiary sector contributed 44.9 per cent to the Meghalay’s GSDP, 27.2 per cent was from the primary sector followed by 27.9 per cent by secondary sector. Meghalaya is an agrarian economy with about two thirds of the total workforce in the state are engaged in the agriculture and allied activities. The contribution of the agriculture sector to the state’s GSDP in 2014-15 was about 1.5 per cent. Bamboo is extensively cultivated in Meghalaya where Natural bamboo forests cover 14 per cent of the state’s total geographical area.